Bank of Ireland, Ireland’s oldest bank, is facing the prospect of being nationalised on Thursday afternoon – one event on a day that is expected to bring untold carnage to the retail banking sector in Ireland and has already been dubbed Black Thursday. Bank of Ireland and Allied Irish Banks shares have been temporarily suspended pending publication of the long-awaited stress tests at 4.30pm. These are expected to confirm another black hole in the four main Irish retail banks and lead to the fifth bailout of the country’s banks since the 2008 financial crash. The Irish Central Bank and Irish Stock Exchange said they took the decision to suspend bank shares to “avoid the possibility of a disorderly market due to the circulation of information or rumours during the day and recognising that the banks may not comment on such information or rumours ahead of the Central Bank announcement this afternoon”. There were reports on RTE on Wednesday night that Bank of Ireland could need a bailout of as much as €5bn which will tip the bank, which was founded in 1783, into state control. This will come as a shock to the Irish public and be seen as an even greater watershed than the bailout of the toxic Anglo-Irish Bank whose reckless lending to developers brought the country to its knees and led to last year’s IMF-EU €85bn (£75bn) bailout. The fate of the bank will be sealed at a cabinet meeting ahead of the stress tests announcement. Already, €46bn has been injected into the banks to keep them afloat. Irish Life & Permanent, Ireland’s largest pensions and insurance company, has also had its shares suspended and is expected to become majority state owned with speculation it could need up to €3bn of a potential total bailout of up to €23n. It has been torpedoed by its loss-making mortgages which are eating up as much as €400m a year. The building society ESB is expected to consume a further €1bn while Allied Irish Banks could need more than €10bn. 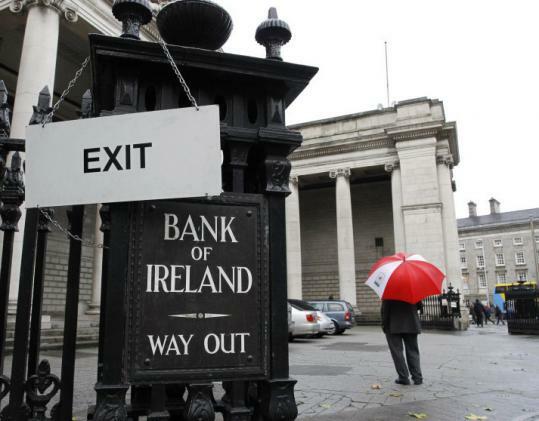 The state took control of the AIB in December when it injected €3.7bn of capital into the institution. It it thought that the government may announce plans to mothball both the EBS and Irish Life & Permanent after a sale of its insurance and pensions arm, which is profitable. The bailout comes as Pimco, the world’s largest bond fund, said on Wednesday that the Irish government and the ECB had to “face reality” that some senior bondholders would have to face taking a loss on their bonds which were guaranteed by the Irish state. Andrew Bosomworth, one of the fund’s European strategists, told Bloomberg that bondholders needed to face “bail in” arrangements in the Irish banks, code for forcing some losses on these investors. “I am reasonably concerned,” he said. He said the line that senior bondholders could not be touched had not worked. “This is fuel for moral hazard,” he said. “Look, Ireland is closing kindergartens to pay senior bondholders – ethically that is a very questionable policy. The press conference will be available to view live online on the following website from 4.30pm. The financial measures programme report will be published at 4.30pm on this page on the www.financialregulator.ie website. The government is hoping the tests will make the Irish banking sector the cleanest in Europe with all future losses flagged. The cash injection is needed to counterbalance future losses and to bring capital-to-loan ratios in the banks up to 12.5% to meet the conditions of the IMF-EU bailout. This will mean the Irish banks will be among the most capitalised in Europe – only Switzerland has tougher capital requirements where the government recommended that UBS and Credit Suisse be required to hold total capital equal to at least 19% of their assets – almost twice as much as the 10.5% demanded under the Basel III accord.